The Muddy Puddles Project is a celebration of kids being kids, in honor of those that can't to benefit childhood cancer research. 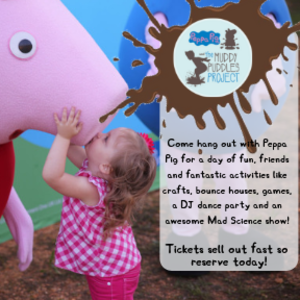 The Muddy Puddles "Party with Peppa" is expected to be a sell-out event in upper Westchester county hosted by Somers Sports Arena and sponsored by Kiwi Country Day Camp. This fundraising event is great fun for youngsters. Join us on March 31st and enjoy. Meet and Greet with Peppa Pig!